Yui Rail Naha Airport Station is the start of Okinawa’s monorail line. Yui Rail is the only rail transportation system on Okinawa. It is now running only within Naha City area, but an extension to Urasoe City is currently under construction and scheduled to open in 2019. Yui Rail has also gained fame as being the only monorail system in Japan that actually runs on black. Maybe that’s the reason it’s also a lot of fun to ride, especially if you know more about each station and their surroundings. Starting with this article, Japan Update will introduce each station and fun places in the vicinity of each station. The first station in the series is naturally the Naha Airport Station, the starting point of the line. At the other end of the line is Shuri Station, which is currently the last station of the Yuirail. 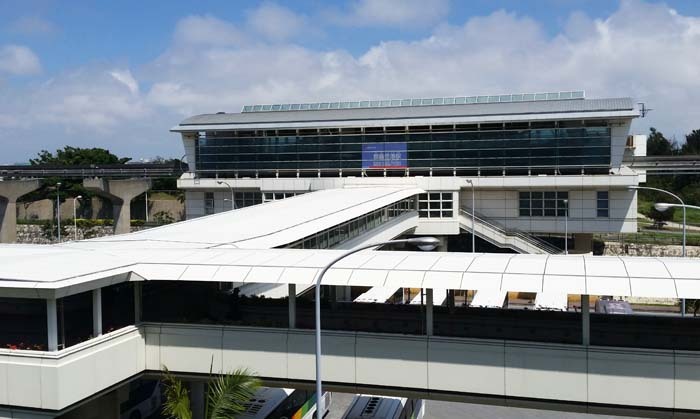 The Naha Airport Station is connected to Naha Airport Terminal Building, and currently a large portion of airline passengers who arrive of leave the airport use Yuirail. But many local people have discovered another fun reason to visit the Airport by Yui Rail. Of course, one can go there to watch airplanes to come and go from the observation deck on the 4th floor of the International Terminal next to the Domestic Terminal Building, but one of the best kept secrets is that there is an official Kirin Beer restaurant called “Kirin Beer & Snack” on the 4th floor of the Domestic Terminal. Of course, I know this is Okinawa and so it should be Orion Beer that has a beer hall at the Okinawa gateway, but sometimes one wants to try some Japanese dry beer for a change. In addition to cold mugs of Kirin Dry draft beer the restaurant also serves special Braumeister beer. Quite a few local beer lovers have discovered the Kirin Beer hall and regularly visit for a few cold ones, after which they jump on Yuirail and have a safe ride home. It’s much cheaper than using a taxi, and the city view from Yuirail cars is much better and fun to watch than from any other public transportation.